Your Village: What’s the story on that Paranormal Express bus in Cedar Rapids? Have a question about what’s going on in your community? Ask Little Village. Submit your questions through the Your Village feature on our homepage, or email us at editor@littlevillagemag.com. There’s good news for the un-undead: the living can rent the Paranormal Express Party Bus. 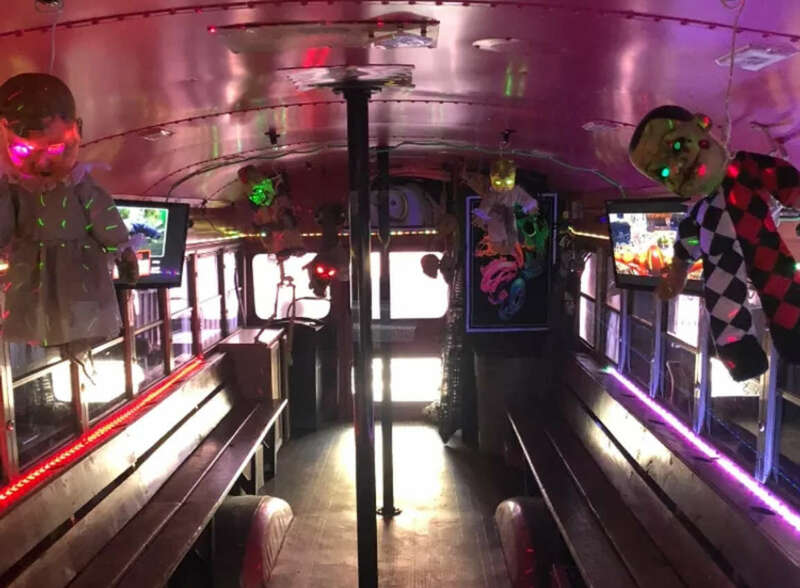 The distinctive looking bus, which made its public debut at last year’s Cedar Rapids New Bo District Czech Village Halloween Parade, is the work of Cedar Rapids resident Peter Durin. But it’s the paranormal part of the party bus’ name that really motivates Durin. He’s a dedicated ghost hunter, and every few months he takes a busload of people looking for a supernatural thrill on a ghost-hunting tour. Durin equips his passengers with tech familiar from cable TV ghost hunter shows: EMF meters (to detect electromagnetic anomalies) and EVP recorders (to capture mysterious sounds). Durin also supplies some very old-fashioned pieces of equipment, dowsing rods. The rods are probably most famous for being used in various folk traditions to detect underground water, but Durin says they also pick up supernatural activity. Regular stops include a former funeral home and two cemeteries, Oakdale Cemetery in Iowa City and Paradise Ridge, just outside Palo. Paradise Ridge, also known as 13 Steps (or 13 Stairs) Cemetery, is surrounded by folklore and urban legends. The graves, it is said, are unquiet and ghostly dogs (or possibly otherworldly wolves) with glowing red eyes patrol the far reaches of the property. Then there’s the witch. Another regular stop on the tour has a name familiar to generations of Iowa teenagers trying to scare each other: Matsell Bridge. The bridge over the Wapsipinicon River, northeast of Springfield, has at least two legends involving tragic deaths attached to it. First, there’s the one about the Matsell family dying on the bridge (didn’t happen), and more recently, there’s the story of a school bus crash that killed all the students aboard (also didn’t happen). The bridge may lack the grisly history discussed by teenagers at sleepovers, but Durin said strange things do happen there. “I’ve seen hundreds of orbs floating in the air above the bridge,” Durin said. He also mentioned a well-known bit of local lore: if you stop your car on the bridge and put it in neutral, spirits will push your vehicle across the bridge. “If you put talcum powder on the back of your car, you’ll see handprints where the ghosts have been pushing you,” Durin said. “The highlight of our trip is going to the Edinburgh Manor in Scotch Grove,” Durin said. The former mental hospital was built on the site of the Jones County Poor Farm, which stood there from 1850 to 1910. The current building was constructed in “1910-1911 to house the incurably insane, the poor and the elderly,” as the Edinburgh Manor’s official website insensitively puts it. It ceased serving patients in 2010, and has become famous in ghost hunting circles, even appearing on cable TV shows about haunted places. According to the official website, at least 80 people died on the grounds on the Edinburgh Manor. “It’s got a terrible history of suicides and everything you can imagine,” Durin said. “In the Edinburgh Manor, we’ve had a full-body shadow reaching out and grabbing people on the stairs, trying to drag them downstairs. We’ve had crazy laughing coming out of nowhere.” And according to Durin, one night a demonic face appeared in one of the manor’s window, staring at the Paranormal Express Party Bus as it drove away. 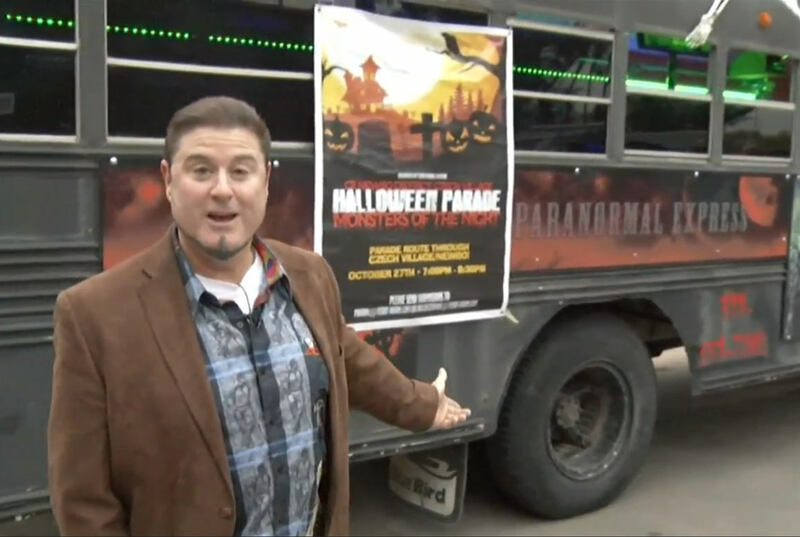 Information about renting the bus and ghost hunting tours can be found on the Paranormal Express Party Bus website. The bus will be part of this year’s CR/New Bo/Czech Village Halloween Parade. Durin, one of the founders of parade, said planning for Halloween in the New Bo District is well underway, and every weekend in October will have special events. It’s actually Oakland Cemetery, not Oakdale.